While every day is Star Wars Day in our hearts, today is May the 4th, the *official* Star Wars Day celebrated by literally everyone. On May the 4th it’s hard to even leave the house today without hearing someone reference this great day. Denver residents didn’t even need to leave the house to get an amazing dose of Star Wars to start their day. 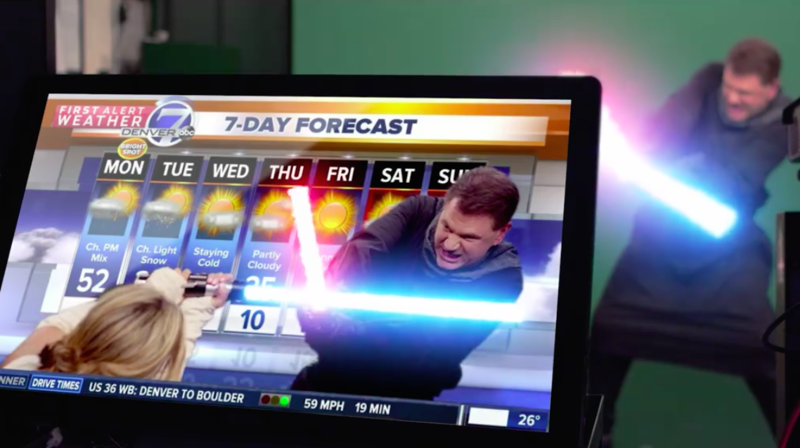 Two local Denver news anchors staged an epic light saber fight, and we don’t know if it could ever be topped. We can’t get over how amazing the production is. In the video, Hildago is our hero as she attempts to thwart the evil Sith Lord Luber. The two use their light sabers to battle it out all around the station, through the newsroom and even into a different studio, as chief Meteorologist Mike Nelson remains oblivious. For those surprised at the quality of the video — it was directed by station producer Travis Lupher, who is also a filmmaker. When finally confronted by a colleague about their antics, Hildago and Luber give a quick rundown on how the iconic holiday came to be. The video is incredibly charming, hilarious, and a little outrageous, everything a Star Wars tribute should be. Thanks for taking the time to make this video, KMGH 7News! May the fourth be with you!